Ernie Banks loved baseball and he loved the fans. On Friday, the fans loved him back, paying their respects during a public visitation at Fourth Presbyterian Church in downtown Chicago. Banks' casket is draped with a No. 14 flag. 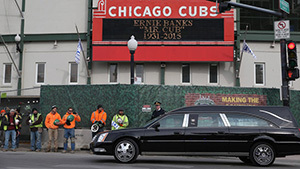 Above the casket is a huge photo of a youthful Banks in a Cubs uniform. The Hall of Fame slugger died Jan. 23 of a heart attack, just shy of his 84th birthday Saturday.